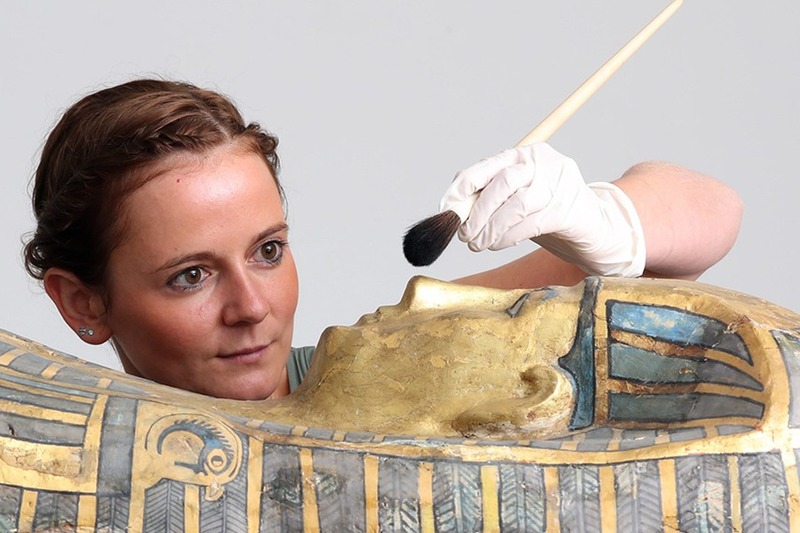 The National Museum of Scotland will complete the venue’s 15-year transformation with the opening of three new galleries showcasing its Egypt, east Asia and ceramic collections. These galleries are the final part a 15-year journey, restoring one of the UK’s finest Victorian buildings, revealing remarkable treasures, and creating inspiring learning experiences to engage more visitors. The Ancient Egypt Rediscovered gallery will present the remarkable culture and achievements of the ancient Egyptians, highlighting individual stories to give a sense of their values and personal lives. The displays will showcase the depth and breadth of National Museums’ Ancient Egypt material with 2019 being the 200th anniversary (May 1819) of the first Egyptian objects becoming part of the collection. Highlights will include the Qurna burial, the only intact royal burial group outside of Egypt, a gold ring said to have belonged to Queen Nefertiti and a unique double coffin of two half-brothers, Petamun and Penhorpabik. National Museums Scotland has one of the most significant East Asia collections in the United Kingdom, representing the three major cultures of the region: China, Japan, and Korea. The Exploring East Asia gallery will present a unique perspective on East Asia, enabling visitors to explore and contrast the diverse traditions, peoples and histories of these three fascinating and dynamic cultures. Among the highlights are a Chinese lacquerware rice measure from the Ming dynasty, a Japanese woodblock print of the celebrated Kabuki actor, Ichikawa Ebizo V and a rare and important early survival Korean lotus-shaped cup and stand from the 13th century. Ceramics are the earliest man-made materials and have been a global artistic medium for around 30,000 years. Situated next to the Balcony Café, this new gallery will give visitors a fascinating insight into the breadth of our outstanding ceramic collections, celebrating the creativity that is reflected in pieces from around the world. As well as celebrating the decorative arts, the gallery will explore the use of ceramics in scientific and technological applications, and will show how this material has been a key component in global trade and cultural exchange for millennia. This Unique Venue of Edinburgh is part of National Museums Scotland, which can cater for a wide range of events. From intimate dinners for 12 to spectacular wedding receptions and awards dinners for up to 950, each museum provides an unforgettable setting for your event. Complete an enquiry form to begin planning your next event.